An unaltered photocopy of your DD-214, or WD AGO 53-55, Special or General Orders, or other military issued document clearly displaying your award of the Army Superior Unit Award. The Army Superior Unit Award is an organization award. The ASU is not an individual award. The ASU is acknowledged to all members of a unit during time of award, and reflected on the personal DD-214, DD-215/Form 1577, or WD AGO 53-55. Only those members who served in the unit during the specific period of activity the ASU is awarded for may apply for a display recognition bearing the veteran's name as well as the unit's name . That is, unit members who served before or after the specific citation dates of the ASU award may not apply for a display recognition bearing a personal name, but may apply for a display recognition bearing the unit name. The Superior Unit Award was established on April 8, 1985, by Secretary of the Army John O. Marsh, Jr. 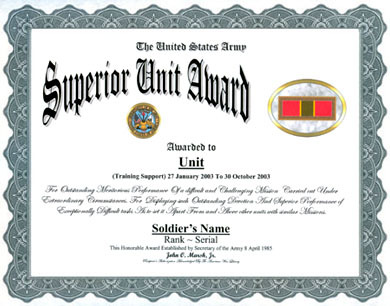 The Superior Unit Award has been in effect since April 8, 1985. The Superior Unit Award may be awarded during peacetime for outstanding meritorious performance of a difficult and challenging mission carried out under extraordinary circumstances. The unit must display such outstanding devotion and superior performance of exceptionally difficult tasks as to set it apart from and above other units with similar missions. The award is not given for operations of a purely humanitarian nature. 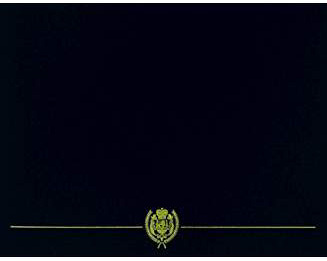 The Superior Unit Award is worn after the Meritorious Unit Commendation and before any foreign unit citation. Additional awards of the Superior Unit Award are denoted by oak leaf clusters. 1. Description: The Army Superior Unit Award emblem worn to represent award of the Army Superior Unit Award is 1 7/16 inches wide and 9/16 inch in height. The emblem consists of a 1/16 inch wide gold frame with laurel leaves which encloses a ribbon of the following pattern: 17/32 inch scarlet 67111; 1/32 inch yellow 67103; < inch green 67129; 1/32 inch yellow; and 17/32 inch scarlet. The streamers are the same pattern as the emblem ribbon. 2. Criteria: a. The Army Superior Unit Award is awarded for outstanding meritorious performance of a unit during peacetime in a difficult and challenging mission under extraordinary circumstances. The unit must display such outstanding devotion and superior performance of exceptionally difficult tasks to set it apart from and above other units with similar missions. For the purpose of this award, peacetime is defined as any period during which wartime or combat awards are not authorized in the geographical area in which the mission was executed. The award may be given for operations of a humanitarian nature. Circumstances may be deemed to be extraordinary when they do not represent the normal day-to-day circumstances under which the unit normally performs its peacetime mission or may be reasonably expected to perform. b. Battalion size and smaller or comparable units, organized under TOE and similar type organizations organized under TDA, are eligible for award of the Army Superior Unit Award. Under most circumstances, headquarters type units would not be eligible for the award. Award to units larger than battalion size would be infrequent. 3. Components: The current components of the Army Superior Unit Award are the emblems awarded to members of the unit and the streamer for display on the unit flag/guidon. a. Army Superior Unit Award Emblem: MIL-D-3943/32 (frame) and MIL-R-11589/304 (ribbon). NSN 8455-01-221-1109. 4. Background: a. As part of the Army Cohesion and Stability Study (ARCOST) of 1980, a proposal to adopt the Army Superior Unit Award was forwarded to Major Army Commands (MACOM) for comment on 18 March 1981. This recommendation was based on the fact that present Army unit awards were for combat service only. While all MACOM\ and most of the Army Staff supported the proposal, the leadership elected not to approve the new award. In 1984, the Vice Chief of Staff, Army, directed that a Peacetime Unit Award be developed and submitted for approval. In April 1985, the Secretary of the Army (SECARMY) approved the Army Superior Unit Award for meritorious unit performance of a uniquely difficult and challenging mission under extraordinary circumstances that involved the national interest. As a result of the strict criteria and lack of approving awards, the criteria was changed by SECARMY in July 1986. This change deleted the words "unique" and "national interest". Only one award was approved prior to the revision and it went to the 3d Battalion, 502d Infantry, 101st Airborne Division. Nearly 200 of the 248 soldiers that were killed in the plane crash in Gander, Newfoundland, were from the battalion and were on their way home in December 1985 from duty with the Multinational Force and Observers in the Sinai Desert. b. On 17 September 1991, in a memorandum to the Secretary of the Army, The Adjutant General (TAG) requested approval to create a lapel pin to be worn by all members of units awarded the Army Superior Unit Award. This recommendation was based on the fact that the award was being presented to units with a significant number of civilians assigned and there was no visible means of recognizing them. This change permitted issue of an emblem to both military and civilian personnel. The Secretary of the Army approved the recommendation on 12 December 1991.
c. The emblem is worn by all members of a cited organization and is considered an individual decoration for persons in connection with the cited acts and may be worn whether or not they continue as members of the organization. Other personnel may wear this decoration while serving with an organization to indicate the unit has been awarded the Army Superior Unit Award.